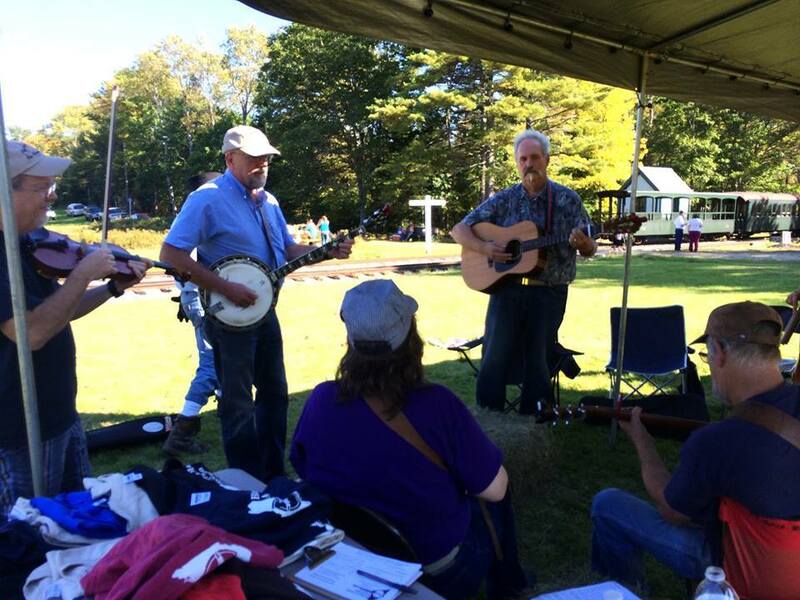 TRAINS AND BLUEGRASS MUSIC a natural blend of fun!! SATURDAY, Sept 29, 2018 – 10:30am to 3pm in ALNA, Maine. ATTENTION: BLUEGRASS PLAYERS all levels of play welcome! 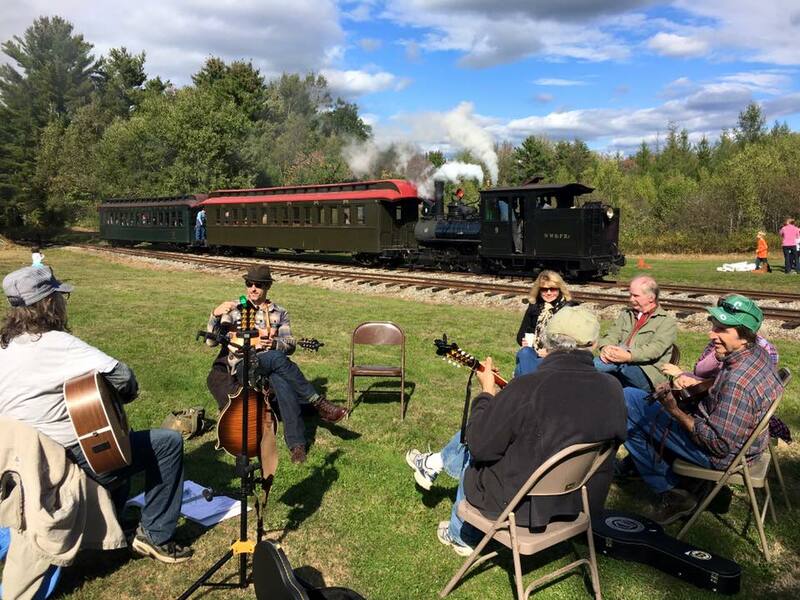 – The Wiscasset, Waterville & Farmington Railway Museum’s FALL FESTIVAL is including a Bluegrass Picking Party. PLEASE CONTINUE READING for ALL INFORMATION. You will be TAKING A TRAIN to the festival area, where there will be picking, face painting for the kids and other Fall Festival activities. 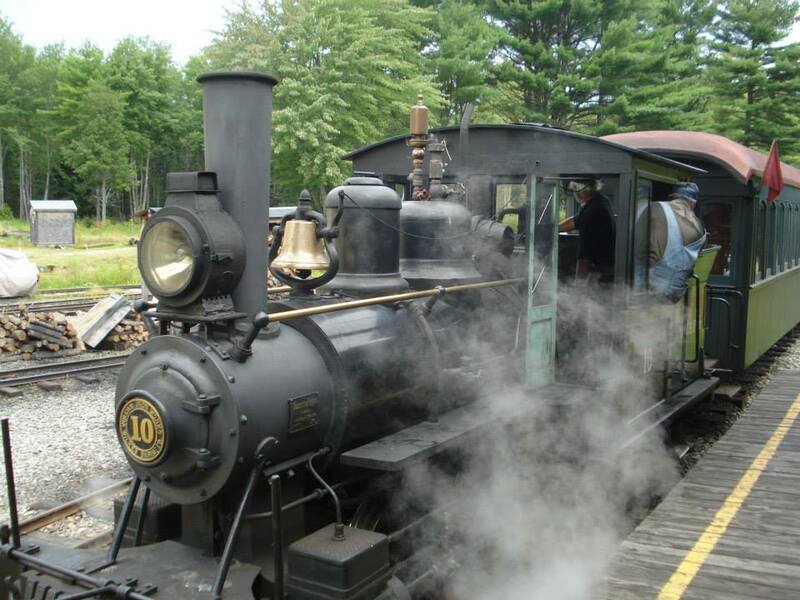 Trains leave Sheepscot Station (the main platform with the Gift Shop) starting at 10:30 AM, 10:55, 12 noon, 12:25, 1:30, 1:55, and 3:00 (the last regular train). IN ORDER TO GET PICKING TIME IN, it is suggested that you get on board by at least 1:30, stay in the picking area as long as you like during the event (most pickers are heading on the train back by 3pm). BLUEGRASS MUSIC ASSOCIATION OF MAINE will have a table set up for info about jams, merchandise & membership sign ups. THE WEATHER LOOKS GREAT, but a little cool, dress accordingly. Chairs will be set up there. 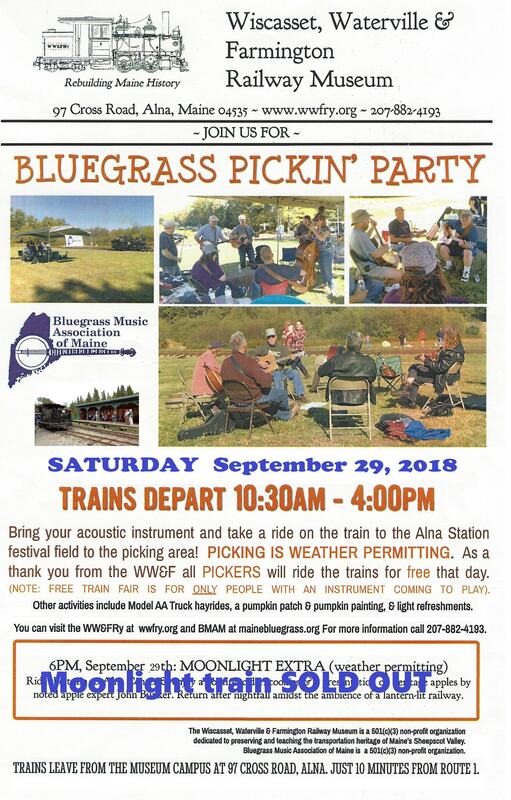 BLUEGRASS PICKERS (with instruments) RIDE FREE — ***ALL guests OTHER THAN pickers can get tickets at the station in the gift shop – $8 for adults $7 senior 60+/$5-kids/tots 3 & under-free. ***Catch an early train for more picking time!! ALL ARE WELCOME. 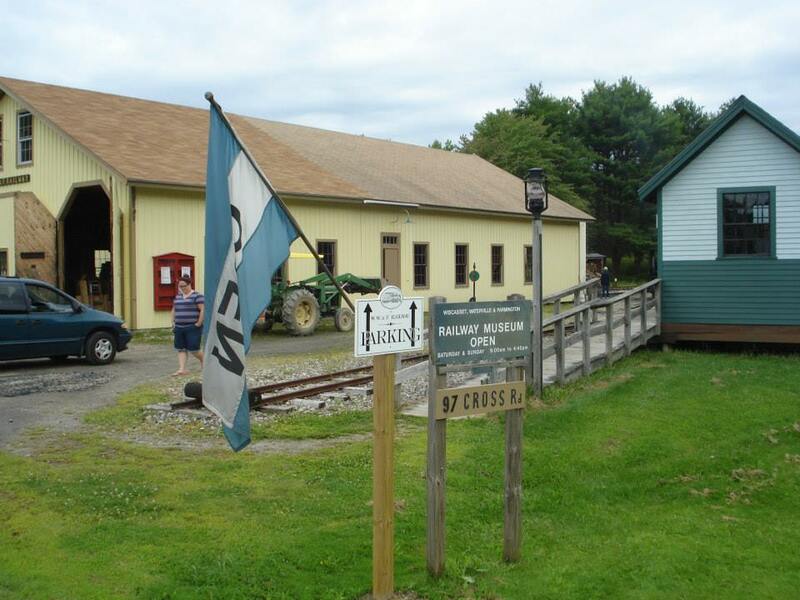 LOCATION: The WWF Railway Museum is located at 97 Cross Street, Alna, Maine. Directly off of Rt 218. FROM Route 1 in downtown Wiscasset, turn on Rt 218 (aka Federal Street a block away from Red’s Eats). Follow 4.5miles to Alna, Cross St. on left. Parking is past the big yellow barn and RR tracks. Family Friendly, lots of kids activities.